Don’t let chilly weather keep you cooped up indoors! With an outdoor fire pit, you can throw a backyard soiree and socialize with family and friends anytime of the year. 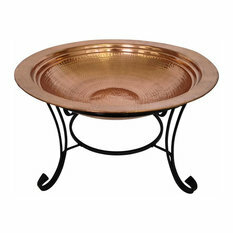 With a variety of styles and designs to choose from, a fire bowl is an ideal addition to any patio or deck. 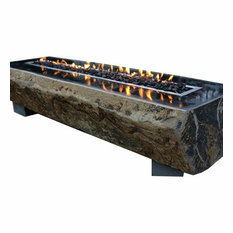 Check out the backyard fire pits for sale below and find your new favorite entertaining piece! What fuel source should my fire pit have? Gas. 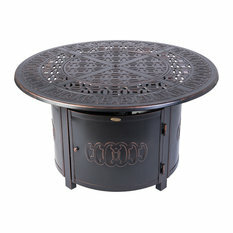 The gas fire pit is a popular choice thanks to its ease of use and low maintenance. These propane-powered models are simple to both ignite and extinguish, and propane gas tends to be environmentally friendly and affordable. The only downside is that you will need to replace the propane tank every so often. Wood. 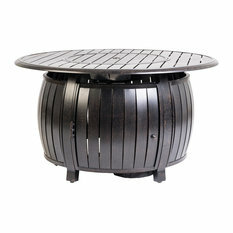 A wood-burning fire pit is reminiscent of campfires and outdoor adventures. Wood is an ideal fuel source for portable fire pits and produces colorful flames and an earthy fragrance. It will require clean up after use, however, and can be difficult to ignite. Don’t use pressure-treated wood as it might contain dangerous toxins; instead, consider woods like red oak, white oak, beech, birch, ash, hickory and maple. Charcoal. If you purchase a wood-burning style, you can also try burning charcoal. This is perfect for a backyard barbecue and roasting marshmallows for s’mores. However, charcoal, like wood, will require clean up after use. Gel fuel. This fuel type is both budget-friendly and long-lasting. Most cans last around two and a half to three hours; however, you can cut your usage short and reuse the can if you have not used all of the product! What styles of fire pits are available? Fire bowls and pits come in many forms, which makes it easy to select a piece that appeals to your personality and fits your needs. 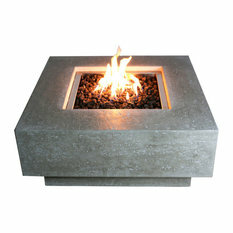 In terms of material and aesthetics, a metal fire pit is always a popular and chic choice; a concrete fire bowl is also considered a sleek addition to an outdoor area. A ceramic fire pit gives off an earthy vibe whereas a round fire pit comprised of stones gives you the feeling of camping outdoors. A smaller design, braziers date back to ancient times when they were used to provide heat, brighten outdoor areas and cook food. Try placing several small braziers around your outdoor space for a unique effect. 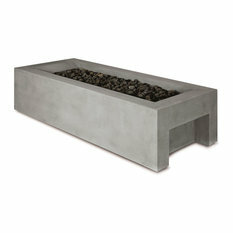 Portable fire pits are typically made of metal or ceramic and usually feature legs and wheels. 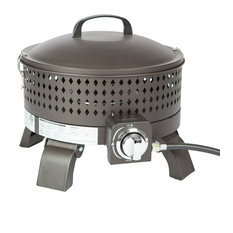 They make it easy to move your main source of heat and light to wherever the party goes. A table fire pit is cleverly designed to (safely) allow your guests to place items on the tabletop surface surrounding the flames, making for a cozy and unique dining experience. A fire ring is a circular device usually made of steel or concrete that surround and contain a fire that is built directly on the ground. These simple but effective designs have no bottom and are purely utilized for containment. More innovative fire rings may have metal bars so that the fire may be used for cooking as well. The portable fire bowltakes on the form of a large bowl supported by a stand. Yours may even be able to use a gel fuel, which tends to be alcohol-based and burns clean. The most common style, traditional fire pits, can technically either be holes dug into the ground or freestanding pieces. Traditionally for home usage, such as on a deck or a porch, a fire pit is a pre-made, portable piece comprised of stone, brick or metal. 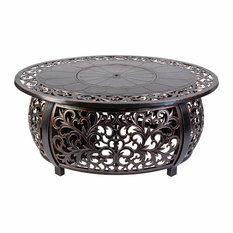 Is there anything else I should consider before buying my new fire bowl? Never leave your fire pit unattended. Always have a fire extinguisher easily accessible (and make sure it hasn’t expired!). Be aware of children and pets. Do not touch your fire pit while it is in use. Patio, Garden And Landscape Co.